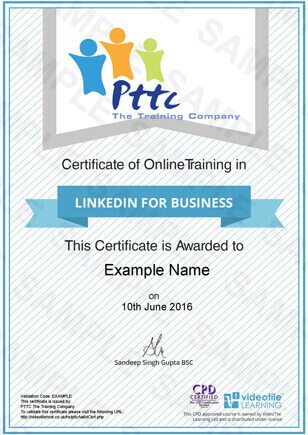 This on-line LinkedIn For Business Training Course from PTTC E Learning is essential for anyone looking to use LinkedIn effectively within their business. With over 450 million users LinkedIn is perhaps the top player in the business social media sector, used correctly it can be a massive tool for any business. Its pointless buying a course & spending time learning, when it wont fit your purpose. So our LinkedIn For Business E Learning Course is 100% fit for purpose and certified by a major player in the education industry sector, so you can rest assured you wont be wasting time or money with us! Who Is This Linkedin For Business Training Course For? LinkedIn is a very well established and respected social network with over 450 million users in more than 200 countries. It’s known as “Facebook in a Suit” or the most professional level of Social networking for businesses. Why Do You Need Linkedin Training Course? LinkedIn is one of the oldest social media platforms, and without doubt the best business to business platform in the world. Started in 2002, it now can boast an amazing 450 million users (2016). 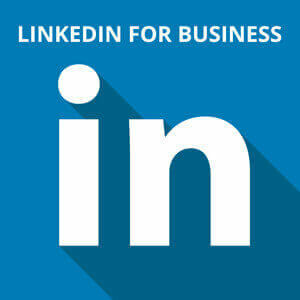 If you work business to business, or you are looking to build relationships or promote products and services to business then look no further than LinkedIn. The average user on LinkedIn will spend 17 minutes per day on the platform. Over the last few years LinkedIn has made advertising on the platform far more accessible, and now LinkedIn ads in some cases are matching performance & ROI as those on Facebook. Our online LinkedIn for Business training course will give you the knowledge and skills to set up your personal profile, a business page, set up a group, to refresh your current profile, start advertising and build a network. No matter if you just starting out on LinkedIn or a seasoned user this course will have something for you. One thing to ask yourself if LinkedIn is for you is to consider if people you want to do business with are on their, and are your competitors getting to them first! Our Fully Accredited and Industry Approved On-line LinkedIn For Business Training Course is aimed at anyone looking to use LinkedIn effectively within their business. With over 450 million users LinkedIn is perhaps the top player in the business social media sector, used correctly it can be a massive tool for any business, can your business afford to not use it. This module will explain to you what LinkedIn is, and how it could work for you from a business perspective. Within this module you will learn LinkedIn policies, LinkedIn Intellectual property rights, and who owns what. In this module we will explain about personal profiles, Groups, and the power of LinkedIn Advertising. In the final module we will explain how to set up your account, how to add content, adding contacts along with setting up a free company profile and some final tips to get the most from LinkedIn. This course complies with the training requirements for On-Line LinkedIn For Business Training. This training will take you through what actually is LinkedIn, to setting up your personal profile, a business page, set up a group, to refresh your current profile, start advertising and build a network. So no matter if your a newbie to LinkedIn or an existing user this course will have something for you. It will provide you and your team with a cost effective, time efficient training solution as well as being one of the best groundings in this subject area for a fraction of the price of other courses. By learning online with us at PTTC The E Learning Training Company, the main outcome of this training course is to provide you or your team members with a recognised qualification, and the knowledge, skills and awareness to get the most from LinkedIn. Once you or your team members have successfully completed the course that takes around 1 – 1.5 hours you can simply download the certificate. If you are not sure if our On-Line Linkedin For Business Training is the right course for you, or if you’re a bit dubious as to the quality of our training course will be what you’re expecting why not try one module of the course of your choice inc the assessment FOR FREE . This will give you a free chance to experience hands on our on-line learning environment. To get a Free Trial Just click on the ‘Free Trial Logo & follow the video instructions to access the online learning area. Once you have trialled the module you will then be given the option to purchase & continue with your course! Our On-Line LinkedIn For Business Training Course has 45 minutes of video to watch, and 20 questions to answer. We estimate that the course should take you no more than 2 hour to complete. If you want to do it over a number of days then that’s fine, the system will remember where you left off and you can go back to it at exactly that point. The simple answer to this is yes, our LinkedIn For Business Training is, the course is CPD Certified (Continued Professional Development) so you can rest assured that this course will meet your needs if you are looking for a competent introduction to the LinkedIn For Business Training. There no problem with that, with our system you get 3 chances as standard to take and successfully pass the LinkedIn For Business Training Course. If you are still unsuccessful at that stage, then just drop us a line and we will provide you with 3 further attempts free of charge. Once you have watched the 14 video lessons and successfully answered the 20 questions you can then simply download and print off your Certified CPD LinkedIn For Business Training Course certificate. This type of training gives lifelong knowledge & skill. There is no legal need currently to take the LinkedIn For Business Training Course again, however like any skill or knowledge we learn memories fade over time especially if we don’t use those skills. So, you can always come back again if you wanted to and refresh your skills and update your knowledge by purchasing and completing the course again. That’s easy as well. You can pay for your LinkedIn For Business Training Course online with your credit card, debit card, or PayPal. However sadly we no longer accept cheques, sheep, horses, or gold.